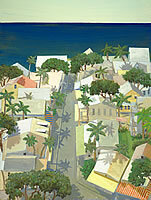 The artist creates an aerial view of structures and throws down irregular shadows to confuse the perspective and loosen an otherwise tight urban scene. The sun-drenched white roofs, the charming architectural details, the abundant greenery, the water in the far background all suggest a small, quiet, southern coastal town in the summer. 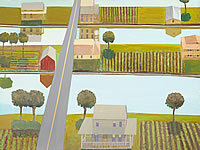 The artist depicts an aerial view of land and sea. 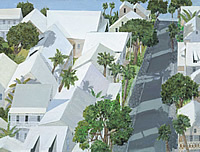 The broken geometric lines of the roofs and the free forms of the trees contrast with the strong directional lines of the road and the beach. Reinforcing the impression that the only audible noise comes from the crashing waves on the beach nearby is the absence of human activity and the peacefulness of the white roofs nestled together. Rows of houses on both sides of a waterway facing one another in a play of reflections in the water. Its strong hue divides the two sides and creates a parallel with the ocean seen in the background. Completing the pattern of lines and division in a peaceful harmony of blues are the horizon and the sky above. A true hymn to nature with warm earth tones and rich rusty reds. 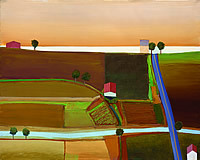 The cultivated farmland has a deliberate abstract quality. Yet it is negated by perfectly stylized farmhouses to yield a tangible reality to the tranquil pastoral scene. 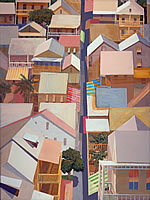 As often in Palmer's work, the broken lines and unusual perspective give the viewer a sense of being in different places at the same time. The artist marries natural earth tones and architectural lines - almost like a vintage patchwork - to depict a rural landscape at dawn. He skews the perspective and creates a tension between vertical and horizontal lines in order to give the viewer the intriguing illusion of seeing the scene from different angles at the same time. 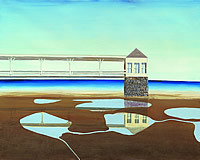 The deliberately limited palette and the simplicity of the shapes, both architectural and random, give this rendition of a pier house caught at low tide a sense of quiet and serenity in a place which might be more active at other times. Reinforcing the quietude of the place is the undisturbed reflection of the pier house in the water below. 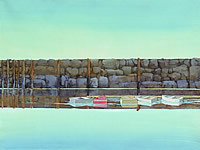 Acharming scene depicting an array of small wooden boats nestled together at a dock. The water, the stone wall beyond and the sky above all add strong lines dividing the canvas horizontally. Waves crashing gently against the small hulls of the boats create the only movement. 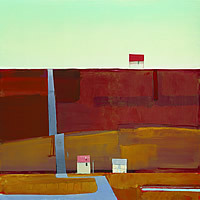 As if to intrigue the viewer, the red boat draws attention in contrast to an otherwise natural palette. Copyright Michael A. Palmer and Birn Fine Art - These images and/or designs are protected under United States Federal and International copyright laws and regulations. Any use or reproduction of these images and/or designs for any purpose whatsoever without express written permission of Michael A. Palmer and Birn Fine Art is prohibited. All rights reserved.